The O-I Experimental is a Japanese tier 5 heavy tank. Once an extremely overpowered monstrosity with titanic alpha damage, almost medium tank levels of mobility (and insane ramming capabilities) and rather weak armor, the O-I Experimental is now toned down. It is now closer to that of higher tier Japanese heavies, having terrible mobility but very thick frontal armor - thickest of all tier 5 heavies. It also features a two sets of viable guns. O-I Experimental still has a fair amount of differences compared to higher tier Japanese heavies - exact opposite to what AP guns are at tier 6-10 (high alpha, poor DPM, gun handling and accuracy), the 7.5 cm gun has great DPM, gun handling and decent accuracy but lackluster alpha damage. The 12 cm derp gun has very powerful HEAT shells, but the HE is still not quite as effective as higher tier Japanese heavies. On top of that, it also has quite a few frontal weakspots unlike its bigger brothers; like KV-5, the miniturrets are weak, and the cupola is also weak. Nevertheless, the O-I Experimental is a meaty upgrade from the Type 95, still a strong tank and prepares the player for the rest of the line. The O-I Experimental leads to the O-I. - The HEAT shells on the derp have high penetration, making the O-I Exp very scary opponent to fight from front. -Dirt cheap shells for 12cm gun, besides HEAT. 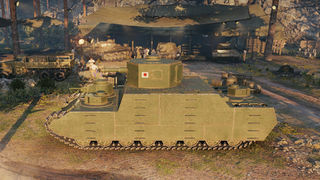 The O-I Experimental can be considered to be first actual Japanese heavy tank, and for most of people huge relief after struggling with widely mediocre Type 95. It already has typical features of the high-tier Japanese heavies - massive size, poor mobility, thick frontal armor, choice of two guns and great gun depression. Whatever gun you use, the O-I Exp. stays as a frontline tank - tank hits and return fire. The frontal armor is thicker than any other tier 5 HT (though overall way less effective than that of KV-220-2), meaning that when top tier, O-I Exp can just push aggressively. When bottom tier however, the O-I Exp will struggle, because the armor is largely irrelevant. It does have very nice view range though, meaning that it is capable of atleast spot enemies if it cant do anything else. The 12 cm derp gun is very similar to the 122 mm Russian howitzer. It does get an AP shell, but its mostly useless as it has same penetration as the HE shell. It can be helpful for overmatching some tanks though, so you can still load a few because the tank has absolutely massive ammo capacity. Top tier, if one can afford it, you can load HEAT and absolutely wreck faces with 360 alpha damage. However, HEAT is fairly powerless when bottom tier, so spamming HE is more adviceable here. Keep on mind that the howitzer has very, very poor shell velocity, so leading shots at long ranges is almost impossible. The shell flies on so high arc that O-I Exp can loop its shells over small ridges and obstacles if aimed from 3rd person mode or if using autoaim, so it can function as pseudo-artillery if used correctly. The 7.5 cm gun is versatile option, having excellent DPM, average penetration and very good gun handling for a tier 5 heavy tank. Top tier it can just melt its enemies, as it can destroy tier 4s and tier 5s in seconds. It is also very capable of permatracking enemy tanks. However, it has poor premium penetration, meaning that with this gun the tank will struggle if bottom tier. It has pretty good accuracy and gun handling, meaning that sniping is actually not impossible with the tank if isnt capable of doing anything else. While the O-I Experimental is generally a shadow of its former itself, it is still a very capable tank. It also prepares the player for the rest of the line. At tier 6, the playstyle generalizes bit more to basically complete lack of weakspots, and harder hitting derp guns. Due to the fact that you can mount everything with the stock suspension, it is recommended that you start with getting the XP for the engine. Suspension, 7.5cm guns and radio are secondary unless one prefers quick-firing guns. The two 7.5cm may already be unlocked from the tier 5 medium Chi-Nu. Otherwise, you have the stock 12cm derp gun to use. The stock derp gun is similar to the Russian U-11 122mm derp gun in performance, but has noticeably slower shell velocity; therefore players should try to get close to the enemy to have a decent chance of hitting them. The stock 12cm leads to both the 75mm guns, which are considered too tiny for such a heavy breakthrough tank. 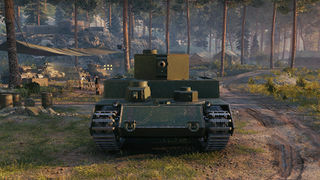 One drawback of these 7.5cm guns is that the premium rounds do not offer significant penetration advantage over the standard AP, and may run into trouble facing heavily armored tanks in higher tiers, so be sure to read the teamlist for expected enemies at each map location and plan ahead. The upgraded engine is quite expensive in terms of XP, but this engine carries over right up the line of heavy tanks. It only adds 9% engine power but considering that higher tiers are quite slow and appreciates any engine power boost, it's recommended to research. Stock suspension is good enough to handle every module, but the upgraded one can make the tank noticeably more nimble. Lastly, research 7.5cm guns if you haven't unlocked them from medium line, unless you have an preference on accurate quick-firing guns. While the O-I itself existed, the tier 5 O-I Experimental is practically a complete fabrication. The tank is based on the "100 tonne prototype" that had only 75 mm armor and could reach the speed of 40 kph. None of the guns of the O-I Experimental were ever proposed on the O-I, the tank dimensions are smaller and miniturrets different. In addition, the built prototype didnt have turrets, so even with 75 mm armor the tank would have been heavier than 100 tons. The armor and mobility, only "historical" traits about the tank, were rebalanced in 9.20, rendering the tank practically completely unhistorical, fabricated version of the prototype of the O-I. The O-I (オイ車 Oi-sensha) was a super-heavy tank prototype designed by the Imperial Japanese Army during the Second Sino-Japanese War after the Battles of Nomonhan in 1939. 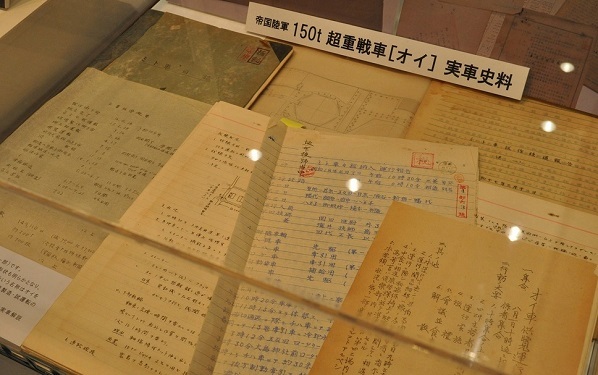 The O-I is one of the Second World War’s more secretive tank projects, with documentation regarding the tank being kept private for over 75 years at Wakajishi Shrine, Fujinomiya. Surviving files have been purchased by FineMolds Inc., and publicly previewed in mid-2015. The multi-turreted 150-ton tank was designed for use on the Manchurian plains as a supportive pillbox for the Imperial Japanese against the Soviet Union. The project was disbanded four years after the initial development began, deemed unsatisfactory for continuation in 1943 after the lack of resource material for the prototype. After 1939, the Imperial Japanese Army quickly came to realize that previous forms of mechanized warfare were proved inefficient after their defeat at Khalkhin Gol. 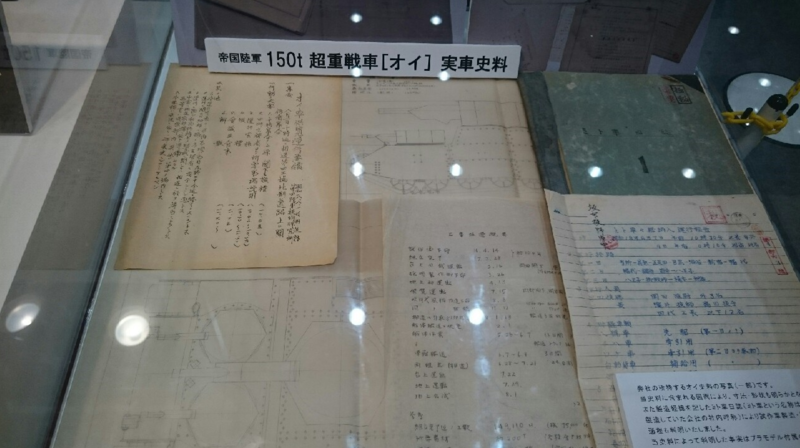 The 4th Technical Research Group began designing the super-heavy vehicle throughout 1940, attempting to meet Colonel Iwakuro’s vague instructions on the ultimate goal of the project. 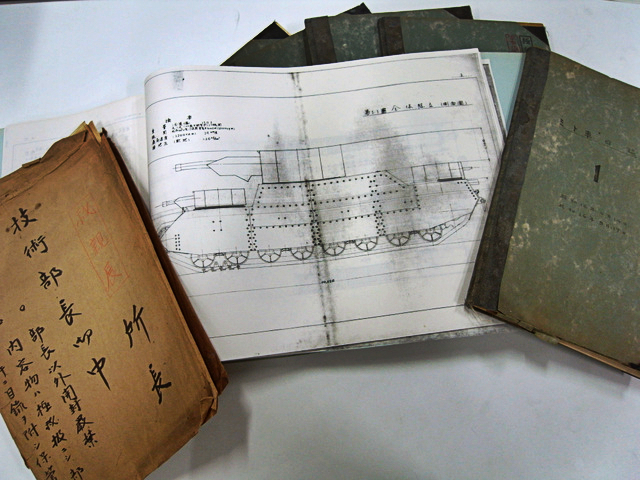 By March 1941, the research group had finished initial tank design and was ready to begin construction. The following month, a group of pre-selected engineers were chosen to partake in the building of the super-heavy tank. One recorded engineer was Shigeo Otaka, who stated they were sent to the 4th Technical Research Group’s previous headquarters in Tokyo. There, they were guided through a barracks containing multiple small fitting rooms, where they were to conduct meetings and reports on the progress of construction of the super-heavy vehicle. Towards the end of the barracks facility was a fully-enclosed room devoid of windows, with soundproofed walls to prevent external personnel from overhearing discussions related to the project. 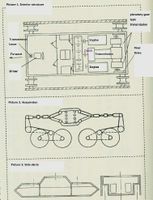 Each officer present possessed a portion of the project’s blueprint, which, when assembled, projected the full design of the tank, labelled "Mi-To". The name originated from a collection of the Mitsubishi industry and the city, Tokyo; given to the vehicle to uphold secrecy of the tank’s project. The chosen engineers voiced their concerns regarding the Mi-To’s design noting that previously, the largest-sized Japanese tank had been the prototype Type95 Heavy in 1934. Issues that had been noted with heavy tank experiments in the years preceding the Mi-To showing Japan’s generally unsuccessful testing on multi-turreted vehicles exceeding the weight of standard armored vehicles. However, with the threat of a second Russo-Japanese conflict becoming more apparent, the project continued despite the engineer’s doubts on the size and mobility of the vehicle. On April 14th 1941, the engineers began the construction of the Mi-To under secretive means. This entailed privately-made mechanical parts and equipment being shipped to the construction zone. Colonel Murata’s original concept was to complete the super-heavy tank three months after the initiation of Mi-To’s construction. This, ultimately, did not come into fruition; as technical issues on the project began to arise. Due to the limitation on material consumption by the government, the amount of parts that could be secretly shipped-in began to dwindle. By the first month of construction, essential construction resources had been depleted and the issues with the vehicle’s cooling system further caused delays. The construction of the Mi-To was postponed until January 1942, a delay of nine months. After the Mi-To’s construction was resumed, the hull was completed on February 8th 1942. The tank had reached near-completion and was being prepared for mobility testing. Mitsubishi built the four turrets for the tank in May of the same year. Initial assembly of the tank’s armament took place soon after the turret’s superstructures were completed. However; the project once again did not have the necessary resources needed for the few remaining parts required for the final assessment. Due to this, the primary turret was removed as it lacked a 35-millimetre-thick roof plate, which had not yet arrived. Thus, the project was put on standby, until further development could continue. The total weight of the vehicle at the time was 96 tons, due to the lack of remaining structural plates and absent 75mm bolted-on armor. The date on which the construction of the tank resumed is unknown, although active testing of the tank was scheduled for late 1943. The tank was unveiled to the Imperial Japanese Army’s highest command in 1943, and received a name change to O-I. This followed Japanese naming convention (O translating to Heavy, I for First, making it "First Heavy") that was standard. In his place was Lieutenant Colonel Nakano, Murata's assistant and colleague. 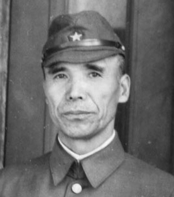 Tomio Hara, head of the Sagamia Army Arsenal, was also present. Following the demonstration, senior officials within the IJA requested that field trials begin in August of the same year. The tank was disassembled at 2:00 AM one night in June of 1943 and sent to the Sagami Army Arsenal in Sagamihara, 51 kilometres from Tokyo. The vehicle arrived at the depot in June, and was reassembled and tested on the 1st of August. On the day of the trials, the O-I performed satisfactorily until the second hour of the tests. While manoeuvring on off-road terrain, the tank sank into the ground by up to a meter; attempts at traversing the hull to extricate the vehicle proved fruitless, resulting in further sinking due to the vehicle’s suspension coils compressing. The tank was eventually towed out, and further testing was continued on concrete. However, the earlier damage to the suspension resulted in vehicle’s movement damaging the concrete, which in turn, further damaged the suspension bogies to the point that further testing could not continue. The trials were postponed, and later cancelled the following day. Nevertheless, the trials conducted at the testing field were considered to be a success, and the vehicle was deemed ready for use in spite of its flaws. The engineers began disassembly of the tank on the 3rd of August due to resources being limited and the inability to maintain the tank in the field. Disassembly of the tank was completed on August 8th. Two days later, the engineers noted in a log that they were to inspect the parts and conduct research to fix the issues the O-I would face. The fate of the O-I after its field-trials which took place on the 1st of August is unclear. Russian reports claim the Japanese were in possession of a wooden O-I mock-up mounting a Daimler-Benz DB 601A engine in 1945, however other sources point to the scrapping of the remaining parts of the same year. 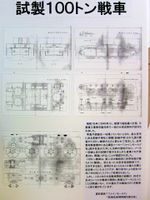 The remains of the O-I reside at the Wakajishi Shrine, with a track link of the prototype still present. Design The O-I was conceived out of the necessity to produce an armored vehicle capable of withstanding modern weaponry being able to return fire with similar firepower. The O-I was designed to act as a mobile pillbox, supporting infantry and mechanized groups along the border of the Soviet Union. The tank had a length of 10.1 meters, width of 4.8 meters, and a height of 3.6 meters. The dimensions of the vehicle closely matched those of the Panzer VIII Maus. The tank was envisioned to have a standard thickness of 150 millimeters front and rear, in order to protect against common anti-tank weapons of the time, yet it was constructed with armor 75 millimeters thick. However, an additional armor plate could be bolted on to bring the total thickness of the armor to 150 millimeters. The use of additional armor allowed for ease of construction and transportation, while also providing the tank with additional defense. Side armor on the hull superstructure was 70 millimeters thick. The additional armor plates were 35 millimeters thick, but armor surrounding the suspension was only 35 millimeters thick. This made the tank’s theoretical armor on the side 75 millimeters. There were eight wheel-supporting beams located on both sides of the suspension area which added an additional 40 millimeters of armor to specific locations on the side of the O-I. 40 ladder pieces were placed around the tank to provide crew with the ability to climb onto of the vehicle with ease. The two 47mm cannons used in the two frontal turrets were also modified to fit the armor layout of the tank. The weapon’s barrels were reinforced with steel to secure them to the tank, due to the standard gun not adequately fitting into the turret. The tank was both designed and built with two inner armor plates to divide the interior into three sections; walls with two doors each and an ultimate thickness of 20mm. This allowed the crew and modules to remain relatively safe while the structure was kept safe with supporting stands. These supports allowed the interior armor plates to stay stable and also prevented collapse. Inside the O-I were two Kawasaki V-12 engines, both located in the rear, parallel lengthwise, to give room for the rear turret operator and transmission. The transmission copied that of the Type97 Chi-Ha’s, but used larger parts and gears making the total weight heavier. The vehicle had a coil spring system, with eight 2 wheeled boggies, totalling 16 individual wheels. The remaining track link of the O-I prototype, at the Wakajishi Shrine in Japan. 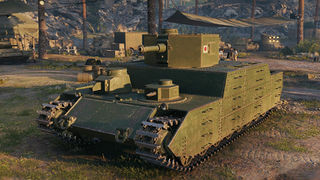 While the incomplete prototype of the O-I was built, which had similar armor and weight to in-game tier 5 Japanese heavy tank, O-I Experimental, it didnt have turrets or full armor mounted on. The in-game O-I "Experimental" is pretty much a Wargaming creation that never existed. None of the armaments available in-game were ever considered on the O-I; the prototype itself didn't have armament mounted on. The main turret and 15 cm howitzer were supposed to be mounted later. The actual proposed armament of the O-I, the 15 cm howitzer, is missing. Tank is incorrectly smaller than O-I in all dimensions. Miniturret design on ingame O-I "Experimental" is incorrect and notably different than that of O-I. The armor is much thicker than the actual prototype (125 mm VS 75 mm). The mobility is inferior to that of the built prototype, though it is comparable to the estimated speed of the O-I in it's full configuration. This page was last modified on 28 November 2018, at 07:00. This page has been accessed 89,669 times.